dammit is an annotation pipeline written by Camille Scott. 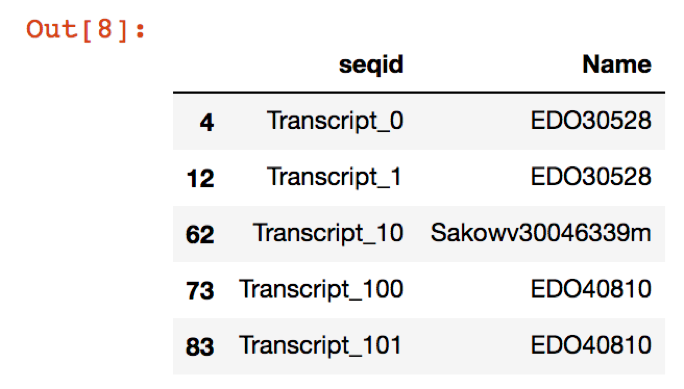 The dammit pipeline runs a relatively standard annotation protocol for transcriptomes: it begins by building gene models with Transdecoder, then uses the following protein databases as evidence for annotation: Pfam-A, Rfam, OrthoDB, uniref90 (uniref is optional with--full). If a protein dataset for your organism (or a closely-related species) is available, this can also be supplied to the dammit pipeline with the --user-databases as optional evidence for the annotation. In addition, BUSCO v3 is run, which will compare the gene content in your transcriptome with a lineage-specific data set. The output is a proportion of your transcriptome that matches with the data set, which can be used as an estimate of the completeness of your transcriptome based on evolutionary expectation (Simho et al. 2015). There are several lineage-specific datasets available from the authors of BUSCO. We will use the metazoa dataset for this transcriptome. Annotation necessarily requires a lot of software! dammit attempts to simplify this and make it as reliable as possible, but we still have some dependencies. dammit has two major subcommands: dammit databases and dammit annotate. The databases command checks that databases are installed and prepared, and if run with the --install flag, it will perform that installation and preparation. If you just run dammit databases on its own, you should get a notification that some database tasks are not up-to-date. So, we need to install them! Note: if you have limited space on your instance, you can also install these databases in a different location (e.g. on an external volume). Run this command before running the database install. #Run  ONLY if you want to install databases in different location. Phew, now we have everything installed! Now, let’s take a minute and thank Camille for making this process easy for us by maintaining a recipe on bioconda. This saves us a lot of hassle with having to install individual parts required for the pipeline. AND on top of the easy installation, there is this slick pipeline! Historically, transcriptome annotation involved many tedious steps, requiring bioinformaticians to keep track of parsing databases alignment ouptut and summarizing across multiple databases. All of these steps have been standardized in the dammit pipeline, which uses the pydoit automation tool. Now, we can input our assembly fasta file -> query databases -> and get output annotations with gene names for each contig - all in one step. Thank you, Camille! You all ran Trinity last week to generate an assembly. The output from Trinity is a file, Trinity.fasta. Today, we’re going to use a de novo transcriptome assembly from Nematostella vectensis. Now we’ll download a custom Nematostella vectensis protein database. Somebody has already created a proper database for us Putnam et al. 2007 (reference proteome available through uniprot). If your critter is a non-model organism, you will likely need to grab proteins from a closely-related species. This will rely on your knowledge of your system! While dammit runs, it will print out which task it is running to the terminal. dammit is written with a library called pydoit, which is a python workflow library similar to GNU Make. This not only helps organize the underlying workflow, but also means that if we interrupt it, it will properly resume! The most important files for you are trinity.nema.fasta.dammit.fasta, trinity.nema.fasta.dammit.gff3, and trinity.nema.fasta.dammit.stats.json. Cammille wrote dammit in Python, which includes a library to parse gff3 dammit output. To send this output to a useful table, we will need to open the Python environment. To do this, we will use a Jupyter notebook. In addition to executing Python commands, Jupyter notebooks can also run R (as well as many other languages). Similar to R markdown (Rmd) files, Jupyter notebooks can keep track of code and output. The output file format for Jupyter notebooks is .ipynb, which GitHub can render. See this gallery of interesting Jupyter notebooks. This will open a new notebook. Press Shift + Enter to execute the cell. To add a new cell, with the “plus” icon. What do these commands help you to see? How might you use this information to modify the names line in the code above? Now, we can return to the terminal, Control + C to cancel and close the Jupyter notebook. We can look at the output we just made, which is a table of genes with ‘seqid’ and ‘Name’ in a .csv file: nema_gene_name_id.csv. Notice there are multiple transcripts per gene model prediction. This .csv file can be used in tximport in downstream DE analysis. Transrate serves two main purposes. It can compare two assemblies to see how similar they are. Or, it can give you a score which represents proportion of input reads that provide positive support for the assembly. Today, we will use transrate to compare two assemblies. To get a transrate score, we would need to use the trimmed reads, which takes a long time. For a further explanation of metrics and how to get a transrate score, see the documentation and the paper by Smith-Unna et al. 2016. The results will be in two separate directoreis, with the important metrics in the assemblies.csv files. We’ve already installed and ran the BUSCO command with the dammit pipeline. Let’s take a look at the results. Challenge: How do the BUSCO results of the full transcriptome compare?